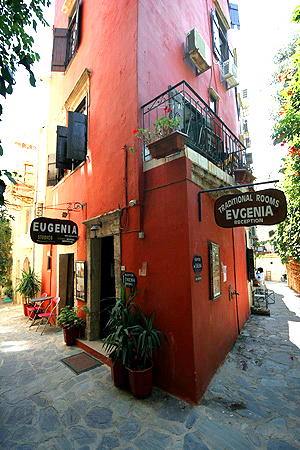 In the heart of the old town of Chania, in the Venetian harbor, in the most privileged and quiet spot of the city of Chania (10 minutes away only from the centre of the town), are situated the luxurious studios of the Neoclassical Evgenia. The owners of this family hotel take care every single detail, have renovated it, and payed attention to every detail, making sure is the perfect environment, with the perfect service. Also they are there to inform you about the sightseeing of the town. The room are clean, luxurious, traditional with metal handmade double beds with curtains and soft and pleasant colours, producing a romantic but also luxurious atmosphere. The Jacuzzi will relax you and from the roof-garden of the hotel you can enjoy your coffee. The rooms have all necessary electric appliances that allow someone to make breakfast, salads or snacks. Free single bed for the rooms that already have one. In a very short distance on foot from the hotel, you will find mini-markets, cafes, tavernas, bars, public offices, bus station, museums and beaches and the most important of all a free parking area. All the services are included in our prices. Thanks you for your attention and look forward to meet you soon.